Poll: Will you be tuning in to RTÉ's live coverage of the papal visit? It’s going to be broadcast across, TV, radio and online. 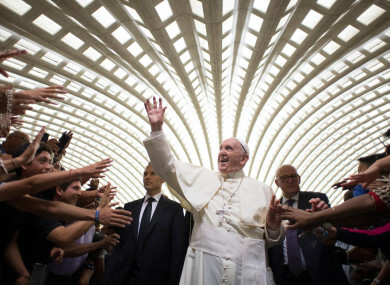 Pope Francis during his weekly audience in the Vatican. EARLIER THIS WEEK, RTÉ unveiled its plans for the broadcaster’s coverage of Pope Francis’ visit to Ireland later this month. The pontiff will be on Irish soil for less than 36 hours but he has a packed schedule, including a concert in Croke Park and masses in Knock and the Phoenix Park. RTÉ has said that as well as broadcasting his public events, a number of other religious shows will be planned. We’ve previously asked whether you will attend the pope’s mass, but today we’re asking if you’ll watch on television. Today’s question: Will you be tuning in to RTÉ’s live coverage of the papal visit? Email “Poll: Will you be tuning in to RTÉ's live coverage of the papal visit?”. Feedback on “Poll: Will you be tuning in to RTÉ's live coverage of the papal visit?”.